Positive ION: Small & Local: Meditation! 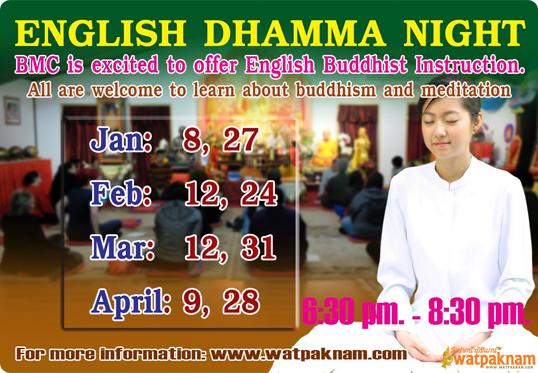 If you are curious about meditation or wish to learn different methods of meditating, you may find the English Dhamma Night at the Buddhist Meditation Center in Sterling Heights very helpful. It is a quiet and tranquil place. The monks are cheerful, friendly, and enjoy answering questions. Also, be aware that this is not a worship service... whatever religion you might have on the way in, you will have on the way out. The Buddha was a man, not a god. This is about mindfulness, respect, kindness, and compassion. You will also learn something about Theravada Buddhism from Thailand. The teachings are called the Dhamma and, as the event implies, there will be English-speaking people to help you understand the concepts. In fact, you have a pretty good chance of catching me there, as well. I enjoy the place. The address is 8500 Plumbrook, Sterling Heights, MI 48313 and it is located just north of 17 Mile Road. The website address is http://www.watpaknam.com/ and some of the information is in Thai, but they have been steadily working English into it, as well. Here is a link to the Guidelines for Visitors in English.